Damaged DNA code is one of the disastrous effects caused by free radicals, which actively contribute to skin aging. With the combined power of nature and modern biotechnological progress, these processes can be significantly inhibited. 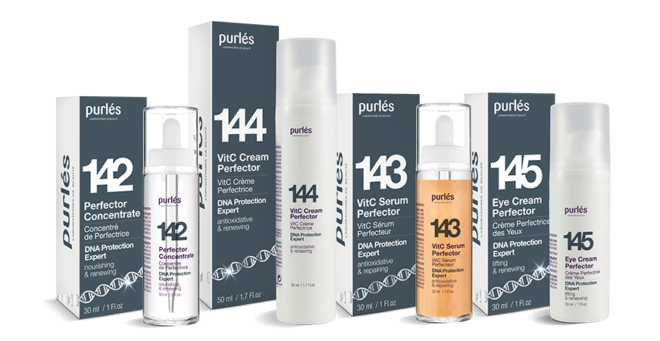 To effectively fight against the visible consequences of oxidative stress, Purlés has designed a new product line: DNA Protection Expert. The complex formula of active ingredients guarantee efficient anti-aging action: nutrition and wrinkle smoothing. Natural components of the products facilitate keeping the skin functions in balance, and in combination with advanced molecules, they provide detoxification and reduction of photoaging symptoms, restoring healthy radiance to the skin.